On October 1st 2015 Veteran New York rocker Bill Popp plunged himself into the world of being a full-time musician. Commemorating the occasion, he released a new single, “Flushing This Plumbing Job Down The Drain,” had a party, and gave a live performance at The Parkside Lounge (317 Houston Street New York City). In 1988 a friend coaxed Popp to take a job working as a plumber for the city of New York and for the last 24 years has worked as a plumber for New York City Parks and Recreation. Now 62, he is able to receive a city pension and is finally, “Flushing His Plumbing Job Down The Drain." To commemorate the occasion, Popp threw a good riddance to plumbing party at The Park Side Lounge located at 317 East Houston NYC, on Thursday October 1st 2015. 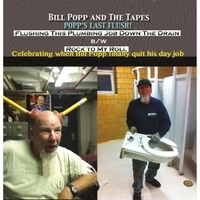 Guests received, at the door, a free copy of Bill Popp and The Tapes' new CD, titled “Popp’s Last Flush,” and were invited to eat, drink and be merry, compliments of the host Bill Popp. This event was open to the public and kicked off at 6:30 PM. A live performance by the band “Bill Popp and The Tapes” was at 8:00 PM, followed by two special guest bands. Sea Monster at 9 PM and The Bowery Boys at 10 PM. There was no cover charge. Bill Popp and The Tapes have been a New York music institution for over 34 years and counting.